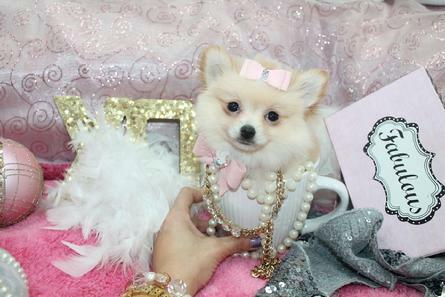 "JACK & KATE" TWO TINY TEACUP PURE WHITE MALE AND FEMALE TEACUP POMERANIANS. FANTASTIC THICK PURE WHITE COATS. 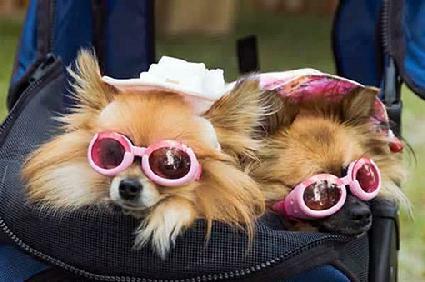 BOTH FEATURE SHORT COBBY BODIES, SMALL TINY ITTY BITTY EARS, BIG DAZZLING EYES, SWEETEST AND SCRUMPTIOUS LITTLE BABIES. 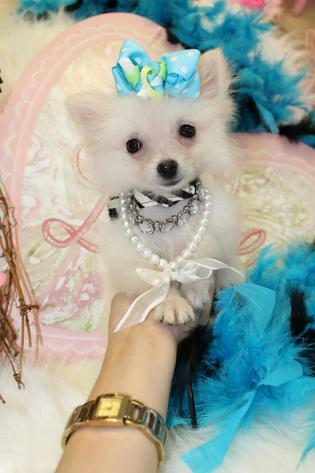 "KATE"$4000 ASTOUNDING TEENIE TINY WHITE MICRO FEMALE POMERANIAN.TEENIE FEMALE, SWEET AND SASSY PERSONALITY. SUPER SMART AND AFFECTIONATE.
" 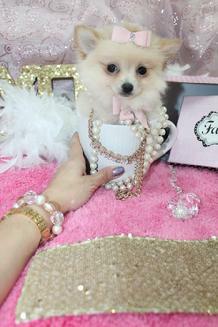 ELEGANT IVORY" $2800 MICRO STUNNING SUPER RARE MICRO TEACUP ALL WHITE AND CREAM MALE POMERANIAN. SHORTEST TINIEST LITTLE LEGS EVER!!!!! LOVES TO CUDDLE, LOVES TO KISSES, SWEETEST PERSONALITY OF ALL, STUNNING AND BREATHTAKING. 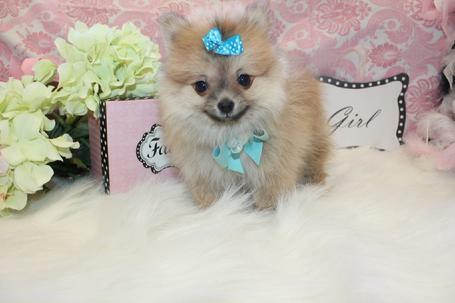 "TERRIFIC TAYLOR" $1250 SUPER SOFT AND SWEET CUDDLESOME LITTLE BABY GIRL TINY POM PUPPY. FANTASTIC COAT, SHORT COBBY BODY, SWEET LOVING PERSONALITY. 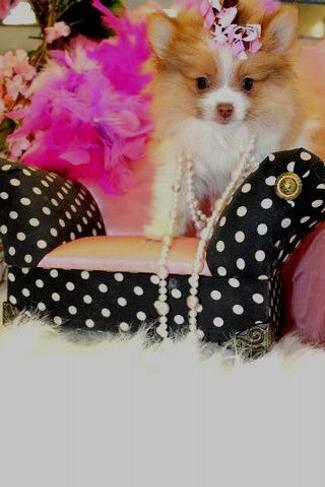 "PRETTY PENELOPE" $1650 STUNNING TINY TEACUP BLACK AND WHITE SUPER RARE FEMALE POMERANIAN PUPPY, SHORT COBBY BODY, ITTY BITY LEGS, SUPER SMALL TO FIT INTO A SMALL CUP!!!!! BEST PLAYFUL AND SWEET LITTLE DISPOSITION, LOVING CUDDLY LITTLE ONE. WHAT SHE LACKS IN SIZE SHE MAKES UP FOR IN KISSES. 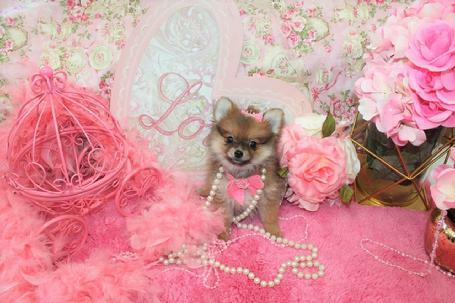 "TINY TINKERBELLE" $1850 STUNNING TEACUP PARTI COLORED POMERANIAN SHORT COBBY BODY, TINY LITTLE LEFS AND FRAME. BEAUTIFUL THICK COAT. KISSY KISSY PERSONALITY LOVES TO SMILE. 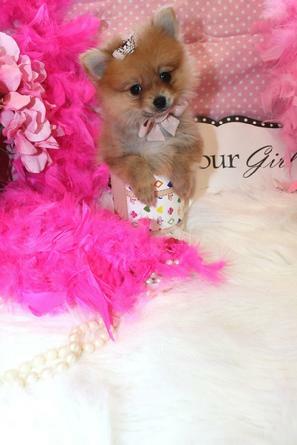 "RUBY" $1650 STUNNING TINY TEACUP FEMALE. SHORT STOCKY BODY, SHORT TINY EARS AND TINY BUTTON NOSE, GREAT COAT. STELLAR PERSONALITY, LOVING AND TEMPERMENT. 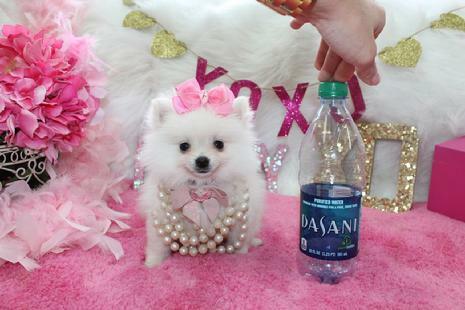 "BELLA BLANCA" $3500 STUNNING TINY TEACUP SUPER BRIGHT WHITE FEMALE POMERANIAN. SHORT STOCKY BODY, GREAT THICK HAIR COAT. 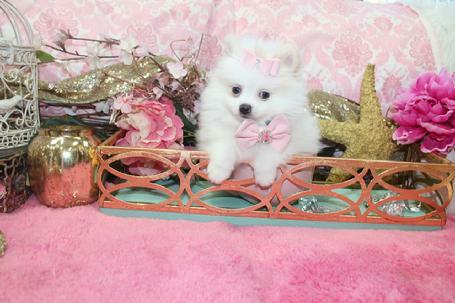 "HEAVENLY HAILEY" $2850 STUNNING CREAM AND WHITE TINY TEACUP FEMALE POMERNIAN, FANTASTIC COAT, BEAUTIFUL LITTLE TINY GIRL, LOVING DISPOSITION, HEART OF GOLD, AND SUPER SWEET AND SMART. 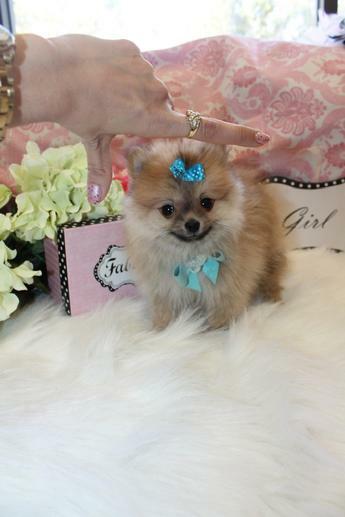 TINY TRIXIE" SOLD SPECTACULAR, TINY, SWEET LITTLE POMERANIAN FEMALE. GORGEOUS FAWN AND CREME COLORING. EXCEPTIONAL IN EVERY WAY. DARLING SWEET PERSONALITY. SHE LOVES TO BE WITH YOU AND SHE GIVES LOTS OF KISSES. PAPER TRAINED ALREADY TOO. 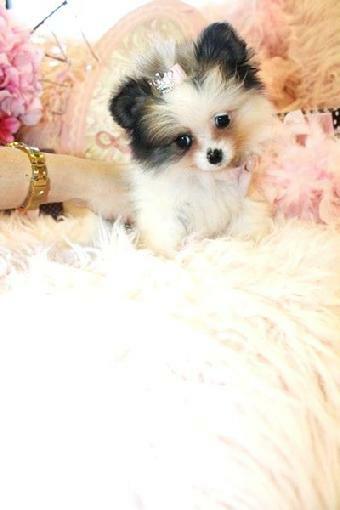 "TINY TRIXIE" SOLD SPECTACULAR, TINY, SWEET LITTLE POMERANIAN FEMALE. GORGEOUS FAWN AND CREME COLORING. EXCEPTIONAL IN EVERY WAY. DARLING SWEET PERSONALITY. SHE LOVES TO BE WITH YOU AND SHE GIVES LOTS OF KISSES. PAPER TRAINED ALREADY TOO. "PEPPER" SOLD TINY. 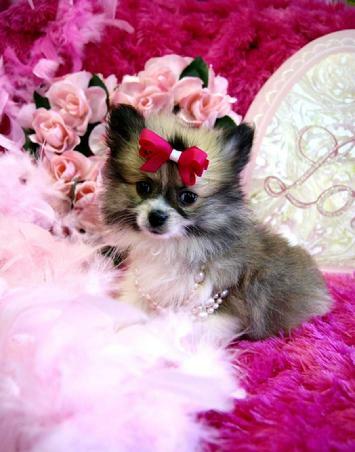 Beautiful TEACUP Female Pom. Gorgeous Black and Gold Coloring. Teddy Bear Face, Short and Compact. Fabulous loving personaltiy. 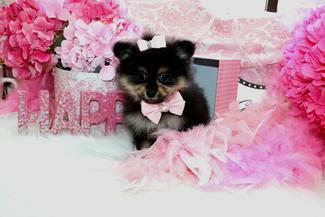 "PEPPER" SOLD TINY Beautiful TEACUP Female Pom. Gorgeous Black and Gold Coloring. Teddy Bear Face, Short and Compact. Fabulous loving personaltiy. "CINNAMON" SOLD TEACUP. 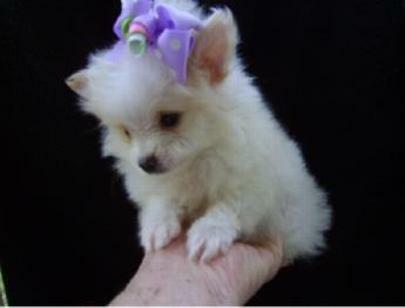 EXTREMELY TINY FITS IN THE PALM OF YOUR HAND OR A MAN'S SHIRT POCKET, VERY TINY Gorgeous TEACUP Female Pom. Beautiful Sable and Creme Coloring. Sweet As Honey! 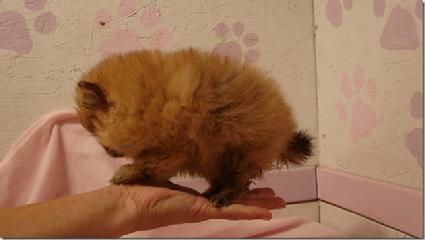 "CINNAMON" SOLD TEACUP EXTREMELY TINY, TINY POM FITS IN THE PALM OF YOUR HAND OR A MAN'S SHIRT POCKET. 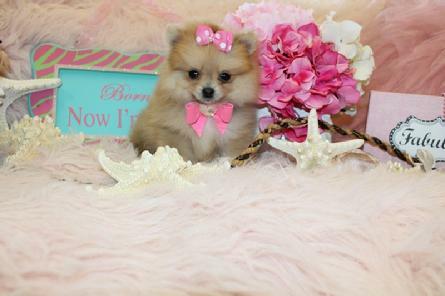 TINY Gorgeous TEACUP Female Pom. Beautiful Sable and Creme Coloring. Sweet As Honey! 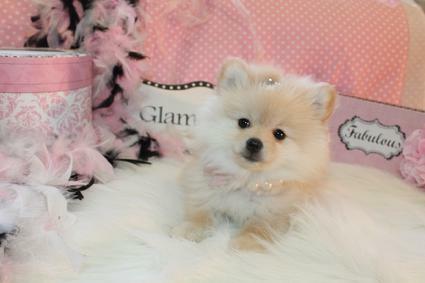 "PRINCESS CHLOE" SALE $3950 TINY STUNNING PETITE WHITE AND CREAM FEMALE POM. SHE IS EXCEPTIONAL IN EVERY WAY. VERY LOVING PERSONALITY. SWEET AND SHE LOVES TO GIVE KISSES. GORGEOUS LITTLE GIRL. 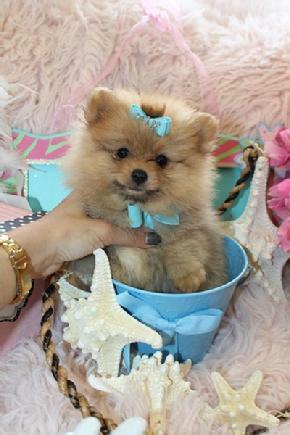 "RASCAL" SOLD SUPER GORGEOUS TINY TEACUP MALE POM. LOVELY CREAM COLOR. PARENTS ARE VERY SMALL, DAD ONLY 3 LBS. GREAT LOVING HAPPY PERSONALITY. HE LIKES TO PLAY AND GIVES LOTS OF KISSES. 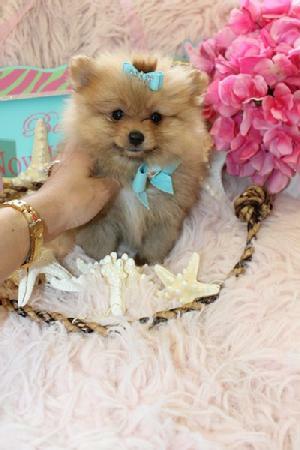 "RASCAL" SALE $1550 SUPER GORGEOUS TINY TEACUP MALE POM. LOVELY CREAM COLOR. PARENTS ARE VERY SMALL, DAD ONLY 3 LBS. GREAT LOVING HAPPY PERSONALITY. HE LIKES TO PLAY AND GIVES LOTS OF KISSES. 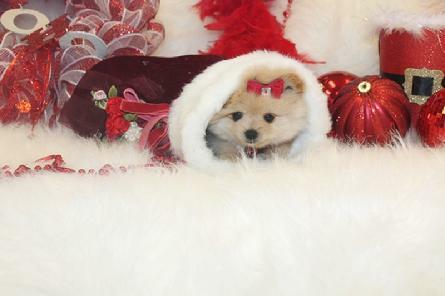 "SANTA'S SWEETHEART' SOLD STUNNING TINY TEACUP POM FEMALE. SHE IS SUCH A BEAUTY, SUCH A SWEETHEART FULL OF LOTS AND KISSES AND LOVE. BEAUTIFUL FACE , BEAUTIFUL SABLE AND CREAM COLRING. A REAL DOLL BABY WAITING FOR ALL YOUR LOVE. 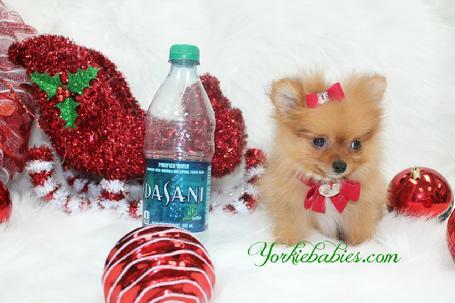 "SANTA'S SWEETHEART' SOLD ! 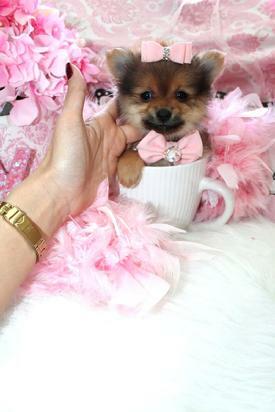 STUNNING TINY TEACUP POM FEMALE. SHE IS SUCH A BEAUTY, SUCH A SWEETHEART FULL OF LOTS AND KISSES AND LOVE. BEAUTIFUL FACE , BEAUTIFUL SABLE AND CREAM COLRING. A REAL DOLL BABY WAITING FOR ALL YOUR LOVE. 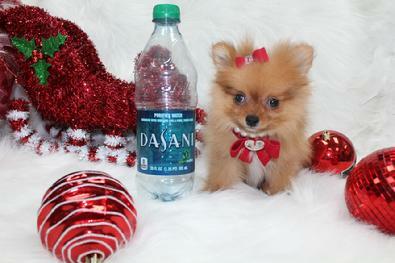 "BABY SHERRY" VERY TINY FEMALE TEACUP POM. SHE IS SUPER GORGEOUS. RED SABLE, JUST STUNNING. VIBRANT BEAUTY WITH LOVABLE PERSONALITY. SHORT AND COMPACT. STUNNING! 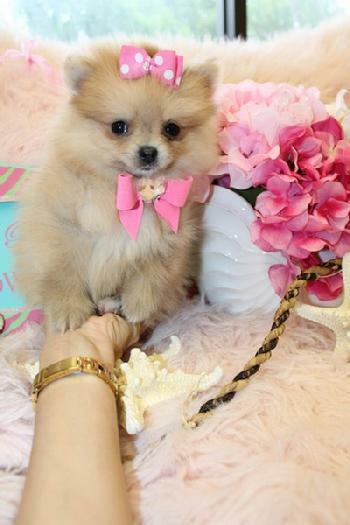 "BABY SHERRY SOLD VERY TINY FEMALE TEACUP POM. SHE IS SUPER GORGEOUS. RED SABLE, JUST STUNNING. VIBRANT BEAUTY WITH LOVABLE PERSONALITY. SHORT AND COMPACT. STUNNING! "CHEYENNE" SOLD! 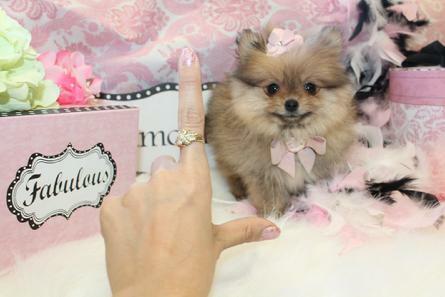 WOW 2.5 LBS FULL GROWN, MICRO, MICRO TEACUP, ONE OF THE TINIEST YOU WILL EVER FIND!! WOW SUPER MICRO TEACUP. TINY 16 OUNCE RARE AUBURN RED WITH CHOCOLATE IN THE LINES. 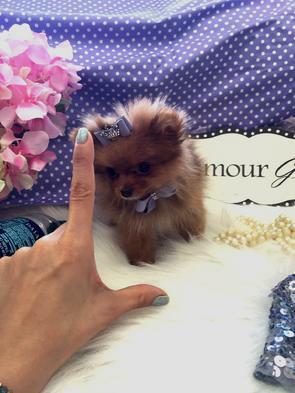 VERY VERY TINY PETITE FEMALE POMERANIAN BEAUTY. SPUNKY, VERY SMART, ALREADY PAPER TRAINED. LOVING KISSY PERSONALITY SHE IS A RARE BEAUTY TO TAKE EVERYWHERE WITH YOU. RARE COLOR!!! "CHEYENNE" SOLD! WOW SUPER MICRO TEACUP. TINY 16 OUNCE RARE AUBURN RED WITH CHOCOLATE IN THE LINES. 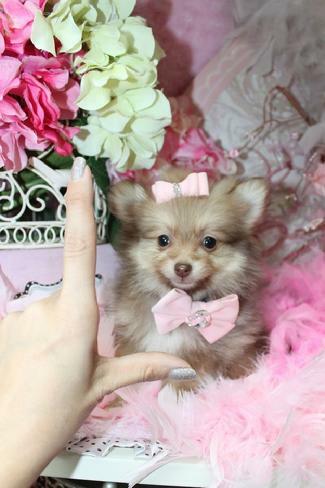 VERY VERY TINY PETITE FEMALE POMERANIAN BEAUTY. SPUNKY, VERY SMART, ALREADY PAPER TRAINED. LOVING KISSY PERSONALITY SHE IS A RARE BEAUTY TO TAKE EVERYWHERE WITH YOU. RARE COLOR!!! "MIMI" SOLD! $2500 MICRO TEACUP!! 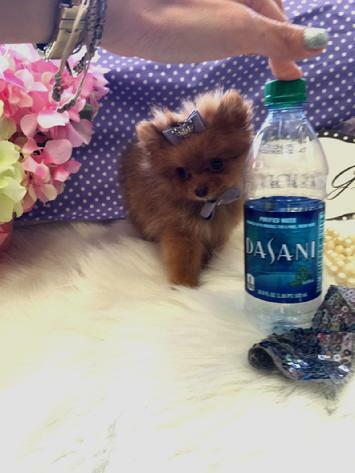 TINY, TINY 16 OZ FEMALE TEACUP POM. GORGEOUS, GORGEOUS, GORGEOUS.!!!! "GLAMOUR GIRL" SOLD! 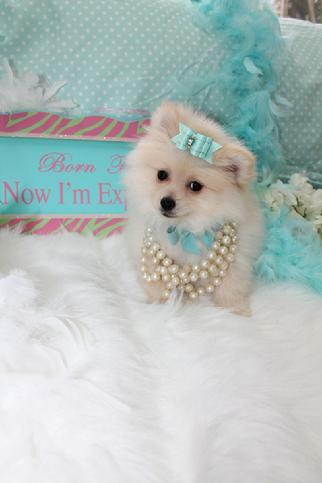 STUNNING LIGHT CREAM AND WHITE FEMALE TOY SIZE POM. SHE IS JUST STUNNING WITH THE MOST BEAUTIFUL FACE AND EYES. ALL LUSH COAT. A REAL BEAUTY WITH THE MOST LOVING HAPPY SWEET PERSONALITY. HURRY, SHE IS PRECIOUS! 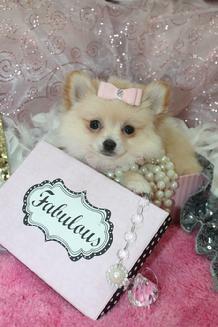 "LITTLE BOO" SOLD~ STUNNIN G FABULOUS ELEGANT TINY TEACUP MALE POM BABY. EXCEPTIONALLY BEAUTIFUL, EXCEPTIONAL QUALITY. HE IS A LITTLE LOVER YOU WILL ADORE. SWEET AS HONEY. "LITTLE BOO" SOLD! STUNNING, TINY, FABULOUS!! JUST SIMPLY GORGEOUS! "PRINCESS GARDENIA" SOLD! 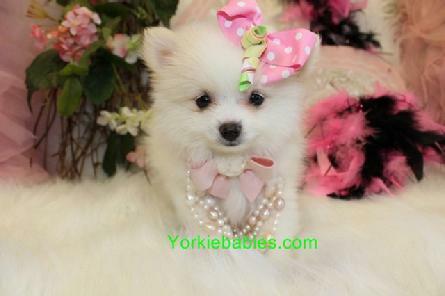 $2500 WOW, THE ELEGANT STUNNING WHITE POMS ARE HERE. 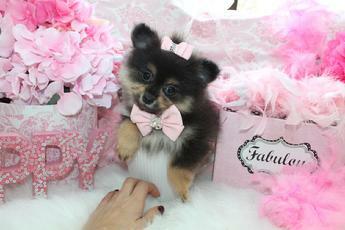 THIS LITTLE TEACUP POMERANIAN FEMALE IS A BEAUTY. SHE IS A SPUNKY, HAPPY LITTLE GIRL WITH PERSONALITY PLUS. EXCEPTIONAL QUALITY. OUTSTANDING DISPOSITION. SMART TOO, SHE IS ALREADY PAPER TRAINED! "CHANTEL" SOLD!! JUST ELEGANT SUCH BEAUTY! "BLUE BEAR" SOLD ! 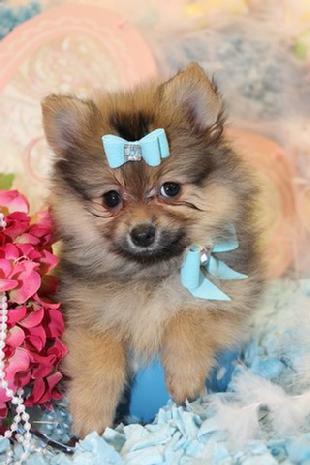 RARE BLUE GREEN EYES, RARE, RARE BLUE PARTY MALE TEACUP POMERANIAN. HE IS REMARKABLE. BEAUTIFUL FACE, BEAUTIFUL COAT, BEAUTIFUL EVERYTHING. HURRY HE IS A RARE BLUE JEAN COLOR. SO LOVING TOO. "PRINCESS ARIANA" SOLD! 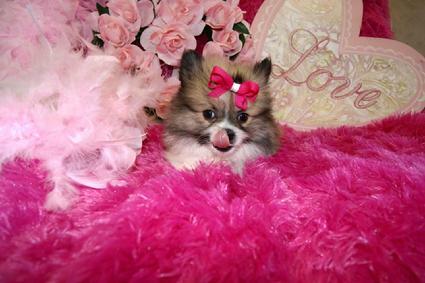 $2000 SPECTACULAR SUPER TINY TEACUP FEMALE POMERANIAN. TEENY TINY TEACUP 18 OZ ONLY. SUPER BEAUTIFUL, GORGEOUS FACE, SHORT ANSD COMPACT, FABULOUS COAT. LOVABLE PERSONALITY. 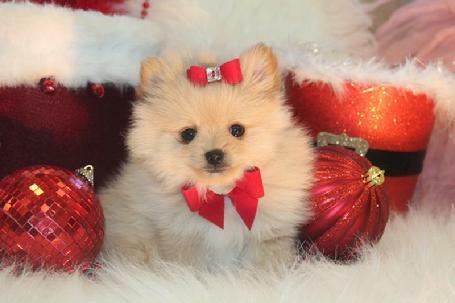 A ONE IN A MILLLION LITTLE POM YOU WILL ADORE. "PRINCESS ARIANA" SOLD! 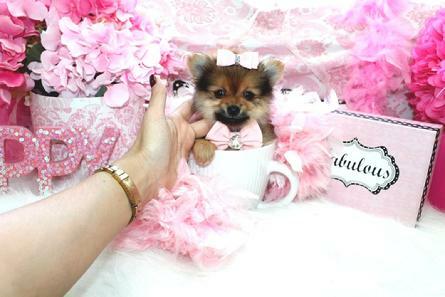 18OZ SPECTACULAR SUPER TINY TEACUP FEMALE POMERANIAN. TEENY TINY TEACUP 18 OZ ONLY. SUPER BEAUTIFUL, GORGEOUS FACE, SHORT ANSD COMPACT, FABULOUS COAT. LOVABLE PERSONALITY. 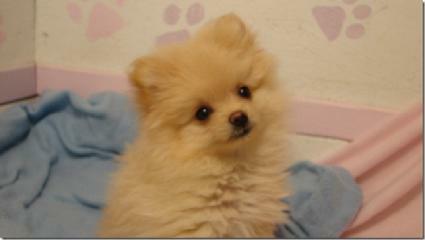 A ONE IN A MILLLION LITTLE POM YOU WILL ADORE. 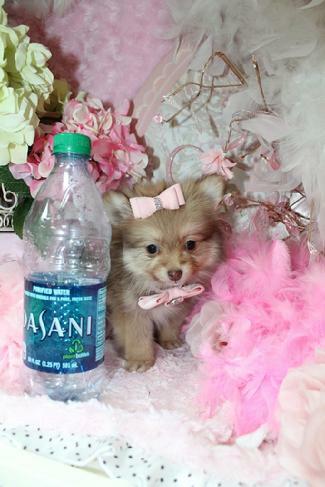 "PRINCESS ARIANA" SPECTACULAR SUPER TINY TEACUP FEMALE POMERANIAN. TEENY TINY TEACUP 18 OZ ONLY. SUPER BEAUTIFUL, GORGEOUS FACE, SHORT ANSD COMPACT, FABULOUS COAT. LOVABLE PERSONALITY. 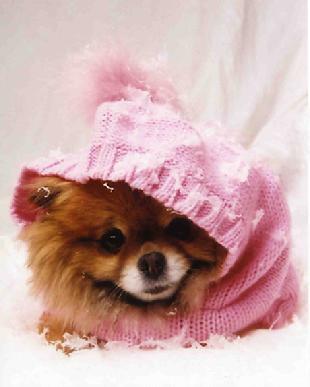 A ONE IN A MILLLION LITTLE POM YOU WILL ADORE. 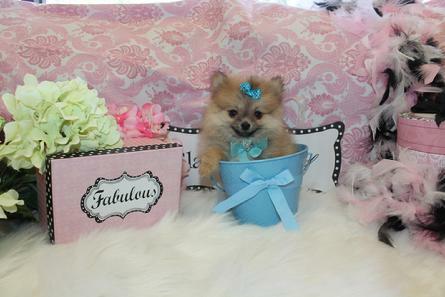 "SUGAR" SALE $1450 STUNNING PARTI COLORED FEMALE TINY POMERANIAN. SHE IS AN ABSOLUTE SWEETHEART. FABULOUS LITTLE TINY FACE, BEAUTIFUL LUSH COAT. SHE IS MOSTLY WHITE WITH DARK BROWN . A REAL DOLL FACE! "CASSANDRA" SOLD!! 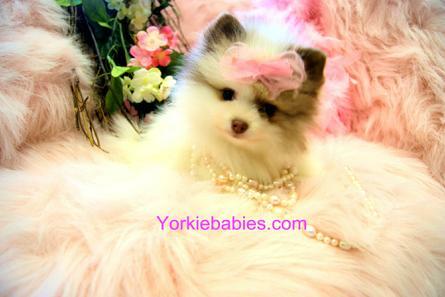 STUNNING, EXQUISITE, ELEGANT FEMALE POMERANIAN. SUPER BEAUTIFUL TEDDY BEAR FACE, GORGEOUS COAT, GORGEOUS FACE AND MARKINGS. JUST EXQUISITE. TAKE ME HOME. "CASSANDRA" AGAIN. ISNT SHE A BEAUTY? "CASSANDRA" I AM SO SWEET! "TEDDY BEAR" SOLD! 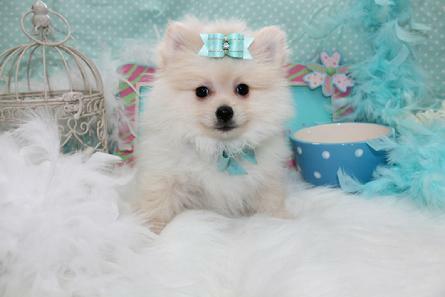 STUNNING VERY VERY TINY 15 OUNCE LIGHT CREME COLORED MALE TEACUP POMERANIAN. HE IS FEISTY, HAPPY, WITH AN UNBELIEVABLE LOVING PERSONALITY. SHORT AND COMPACT TOO. BEAUTIFUL LITTLE FACE, FABULOUS COAT AND SO GORGEOUS IN EVERY WAY. ANYONE WOULD BE LUCKY TO HAVE HIM. SO SWEET! "BABY GIRL" SOLD! 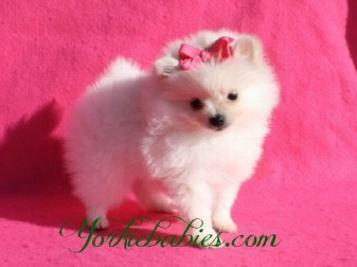 TINY 20 OUNCE WHITE TEACUP POM BABY. SHE IS STUNNING. BEAUTIFUL FACE, SHORT AND COMPACT, DAINTY FEATURES, JUST STUNNING. THESE POM LITTERS ARE EXCEPTIONAL IN EVERY WAY. THEY ALWAYS LOOK LIKE THEY ARE SMILING AND LOVE TO BE WITH YOU. ELEGANT!! "DARCY" SOLD! 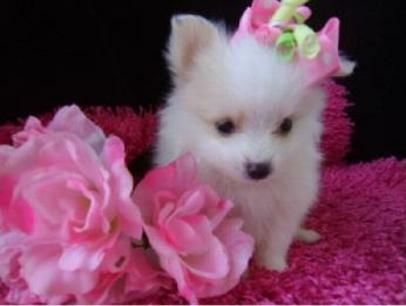 STUNNNING LIGHT CREME COLOR LITTLE FEMALE TEACUP POM BABY. FULL OF LOVE AND SWEETNESS. SHE IS AN ABSOLUTE BEAUTY. 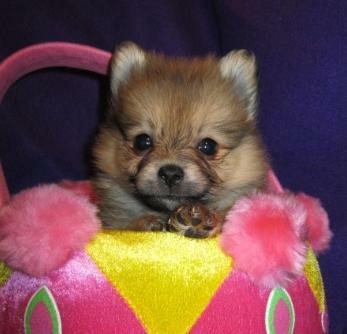 "SANDY BABY" STUNNING SMALL LITTLE FEMALE POM. BEAUTIFUL SABLE COLOR. PETITE AND SWEET AS HONEY. 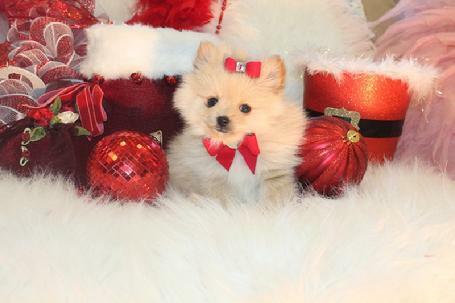 Our Teacup Pomeranians and Pomeranian Puppies are in Alabama, Alaska, Arizona, Arkansas, California, Colorado, Connecticut, Delaware, Florida, Georgia, Hawaii, Idaho, Illinois, Indiana, Iowa, Kansas, Kentucky, Louisiana, Maine, Maryland, Massachusetts, Michigan, Minnesota, Mississippi, Missouri, Montana, Nebraska, Nevada, New Hampshire, New Jersey, New Mexico, New York, North Carolina, North Dakota, Ohio, Oklahoma, Oregon, Pennsylvania, Rhode Island, South Carolina, South Dakota, Tennessee, Texas, Utah, Vermont, Virginia, West Virginia, Wisconsin, Wyoming.